This year, I must say, Virgin America really rose to the occasion by being incredibly cooperative. We’ve added Air Canada and Spirit Airlines to the list. American, United/Continental, Southwest and US Airways were also helpful, while Delta was not very helpful and Spirit Airlines did not return several calls or e-mails. Finally, the last day they did e-mail a curt response saying they didn’t have time. Really? No time to look at the packages and read off the calories? It was a struggle to get anything from them, so I assume they are just not interested in the health of their customers. Spirit was clearly the least helpful, and in second-to-last place, it was Delta. Delta and Spirit Airlines – shame on you. Aren’t these airlines aware that both food and your health are very important to you? Since last year, United has taken a step backward, and since they’ve merged they’ve taken down Continental, too. It feels as if they’re giving up on offering healthy items. JetBlue still needs to do more work on their food — they are not a small discount carrier anymore and need to upgrade to real, healthy whole foods, not just #snacks. Last year they offered snack boxes — great, but they still need more nutrient-dense items. And they eliminated the healthy nuts — too bad. US Airways really stepped up their cooperation this year, and they also have one or two healthier items — nice work! American needs to get rid of all the super-high-calorie snacks and meals. They have some of the highest-calorie foods in the air. Air Canada is really amazing in terms of food quality and their focus on health. While most items have the nutritional content on the packaging itself, they also have a nutritional data sheet for all items on board should passengers request the information. That’s incredible. The most improved is Virgin America, which is also paying attention to the health and well-being of their passengers. They have an innovative and creative food program. These two are neck and neck for the top spot this year. Here are the snack and onboard food-service offerings from several of the more popular airlines, along with #Diet Detective’s comments, ratings (Health Score: 5 stars = highest rating, 0 stars = lowest), calories, exercise equivalents (amount of walking required to burn off the food consumed) and personal favorites. Cooperation in Providing Nutritional Information: Extremely helpful. Best Bets: This airline cares about its passengers’ health — that’s for sure. The airline calls their food Air Canada NutriCuisine and prides itself on the freshness and optimum quality of ingredients. They contract with a company called Food with a Conscience nutritional program ( www.foodwithaconscience.com) to help create their menu. They can do slightly better on the individual snack offerings though. Pick the Nissin – Chicken Ramen Noodle Soup. It will fill you up and it’s more like a meal. The cashews need to be shared. They will fill you up but have too many calories for one person. I love the idea of the Celery & Carrots with Ranch Dip — nice touch. I just wish the dip were hummus or something healthier than ranch. As far as the meals go, they are all relatively low in calories. Go for the chicken or roast beef wrap or the vegetarian sandwich (nice!). The healthy oatmeal is also a great offering. Celery & Carrots with Ranch Dip $5.00 (230 calories, 50 minutes of walking). Cheese & Crackers $4.00 (320 calories, 69 minutes of walking). Nissin – Chicken Ramen Noodle Soup $3.00 (290 calories, 63 minutes of walking). Krispy Kernels – Salted Cashews $3.00 (310 calories per half cup, 67 minutes of walking). Krispy Kernels – Trail Mix $3.00 (390 calories, 84 minutes of walking). Pringles Original – Grab and Go! $3.00 (220 calories, 48 minutes of walking). Lindt Swiss Classic – Milk Chocolate Bar $3.00 (533 calories, 119 minutes of walking). Twizzlers – Licorice $3.00 (833 calories, 191 minutes of walking). Pepperoni, four cheese blend, crispy flatbread. Total = 400 calories, 86 minutes of walking. Grilled chicken breast, sundried tomato pesto mayonnaise, three cheese blend, flatbread. Total = 430 calories, 93 minutes of walking. Roast beef, tomato, mayo, shredded cheese, red onion, oven-fried flatbread. Total = 440 calories, 95 minutes of walking. Mediterranean hummus, grilled zucchini, red pepper, grape tomatoes, Kalamata olives, baby arugula, grilled spinach panini. Total = 390 calories, 84 minutes of walking. Eggs, bacon and cheddar cheese on an English muffin. Total = 310 calories, 67 minutes of walking. 420 calories, 91 minutes of walking. Summer berry and sweet vanilla oatmeal. Total = 330 calories, 71 minutes of walking. Cooperation in Providing Nutritional Information: Very helpful and most improved. They were incredibly responsive! The calories (lower) and nutrient density (higher) of the items have also improved since last year (although we had to estimate last year’s #nutrition information). What’s also pretty neat about Virgin America is that they offer on-demand in-flight food ordering via a touch-screen on every seatback. You can order any time, not just when the carts come through. Nice work, Virgin America! Best Bets: In terms of individual snacks, the PopChips are a low-calorie choice; however, the best choice is the nuts. They are packed with important nutrients and will help keep you full longer than other snack choices. But you still need to split them with someone. The oatmeal is a good breakfast choice at 310 calories — a nice whole grain to get you started in the morning. Virgin’s snack boxes, such as the protein meal with hummus, nuts and tuna, are great. They’ll fill you up and will be a real meal. To be honest, the Jet Set Kid’s Pack could set a better example. I wish it had some healthier choices, but at least it’s relatively low in calories (compared to other airline snack boxes). In terms of meals, the Edamame and Portobello Mushroom Wrap is filled with great stuff and has 9 grams of fiber and 20 grams of protein. Wow! The only negative is the high sodium content (1,300 milligrams). Another good choice is the Egg and Vegetable Salad Wrap, which is filled with high-quality protein and has only 370 calories. Chex Mix (420 calories, 91 minutes of walking). Emerald Deluxe Mixed Nuts (382.50 calories, 83.25 minutes of walking). PopChips (100 calories, 22 minutes of walking). Umpqua Oats Kick Start All Natural Oatmeal (310 calories, 67 minutes of walking). Crackers (60 calories), hummus (63 calories), mixed nuts (170 calories), Craisins (100 calories), tuna (110 calories), Toblerone Mini (67 calories). Total = 570 calories, 123 minutes of walking. Snyder’s of Hanover Mini Pretzels (160 calories), Old Wisconsin Salami Slices (90 calories), Thin Addictive Cookies (100 calories), Welch’s Fruit Snacks (80 calories). Total = 430 calories, 93 minutes of walking. Goldfish Crackers (100 calories), Ritz Peanut Butter Sandwiches (130 calories), Giddy Strawberry Dip ’Ems Biscuits (140 calories). Total = 370 calories, 80 minutes of walking. Mini bagels, plain/strawberry cream cheese, fresh tropical fruit, fruit yogurt. Total = 450 calories, 97 minutes of walking. Edamame, fresh mint, walnuts, Portobello mushrooms, arugula, cucumbers, peppers, spinach flatbread, tropical fruit salad. Total = 620 calories, 134 minutes of walking. Hard-boiled eggs, cucumber, squash, onions, carrots, spinach, tomato, mayonnaise, flax seed tortilla wrap. Total = 370 calories, 71 minutes of walking. Cooperation in Providing Nutritional Information: Very helpful. United has slipped on their snack boxes. Continental and United have merged and now, except for one item, offer the same food choices. Several years ago, United had an amazing assortment of healthy offerings, and was really focused on health. Now there are only a few decent healthy choices; however, the nice thing is that most of the meal choices for lunch and dinner are relatively reasonable in terms of calories. Except for the nuts, all of the individual snack offerings are poor choices. Best Bets: On flights longer than two hours, go for the Tapas, which have some great foods, including almonds, olives, hummus and bruschetta – just toss out the cheese spread. All of the individual snacks are pretty high in calories. I realize they’re meant to be shared, but even so, there is no one standout among them. If you have a family of five or six (not very likely) and wanted to split the almonds, they are really the only snack choice that has real nutritional value. You should avoid the chips and cinnamon rolls. That doesn’t leave too many individual snack options. All the snack packs are very high in calories. There are elements in each that are OK; however, if I had to choose, the Savory is probably the best — just watch that fruit-and-nut mix. In terms of meals, the yogurt is not too bad for breakfast. Skip the cheese and fruit plate — it gives the illusion of being healthy, but it’s not at all, and there is really not much fruit to speak of other than the dried fruit. For flights longer than three hours, United has several healthy choices, but I really like the Grilled Chicken Spinach Salad at 360 calories, including the dressing. 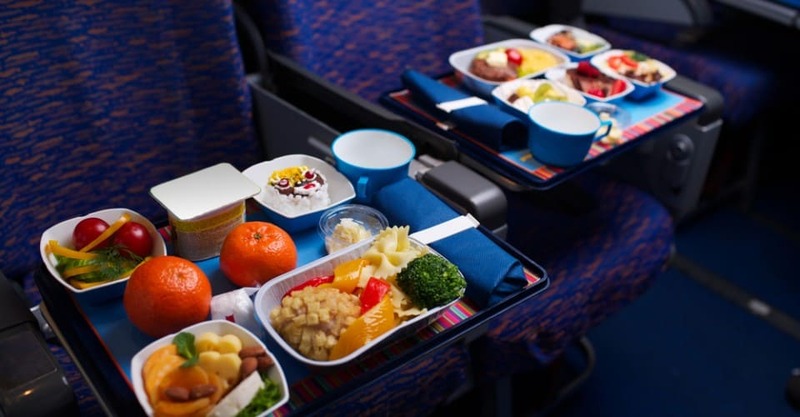 The other choices, including the Asian Noodle Salad, Thai Chicken Wrap and Turkey Sandwich, are OK choices compared to those of other airlines, and in term of calories they are decent for lunch or dinner. For breakfast, your best bet is the Yogurt Parfait – or, if you’re interested in meat ,you can order the Ham and Cheddar Rustic Ciabatta Sandwich, which is 318 calories (not bad), and you can get rid of half the roll and save about 100 calories. Pringles $2.99 – 2.6-ounce can (375 calories, 81 minutes of walking). Two-Bite Cinnamon Rolls $2.99 (330 calories, 71 minutes of walking). M&M’s Pretzel $2.99 (372 calories, 80 minutes of walking). Olives (40 calories), Milas Bruchetta Spread (48 calories), Fresh Garden Hummus (63 calories), Rondele Peppercorn Parmesan Cheese Spread (79 calories), Italian Crackers (90 calories), Jacobs Crackers (68 calories), Partner Olive Oil Crackers (50 calories), Emerald Natural Almonds (100 calories), Fantis Ouzo Candy Mint (15 calories). Total = 553 calories, 119 minutes of walking. Snyder’s of Hanover Mini Pretzels (50 calories), Jacobs Crackers (68 calories), Nabisco Oreo Cookie (100 calories), Jelly Belly Assorted Flavors (46 calories), Hormel Hard Salami (110 calories), cheddar spread (70 calories), Pepperidge Farm Goldfish (100 calories). Total = 544 calories, 117 minutes of walking. Stoned Classic Tortilla Chips (180 calories), Azar Fruit & Nut Mix (110 calories), Cascadian Bar Chocolate Chip (140 calories), Ortega Salsa (10 calories), Asher’s Chocolate Pretzel (110 calories). Total = 550 calories, 119 minutes of walking. Vanilla yogurt with mixed berries and granola. Total = 260 calories, 56 minutes of walking. Shaved ham and cheddar cheese on ciabatta bread (310 calories), served with Dijon mustard-mayo sauce (8 calories). Total = 318 calories, 69 minutes of walking. Muenster, cheddar, Gouda and Brie cheeses (320 calories), dried apricots (10 calories), crackers (70 calories), pecan halves (50 calories). Total = 450 calories, 97 minutes of walking. Grilled chicken breast, romaine lettuce, carrots and red and yellow bell peppers wrapped in a tortilla (470 calories), with Thai aioli sauce (100 calories). Total = 570 calories, 123 minutes of walking. Smoked turkey, provolone cheese and lettuce on a pretzel roll (440 calories), stone-ground mustard-mayo sauce (100 calories). Total = 540 calories, 117 minutes of walking. Chilled noodle salad topped with stir-fried vegetables, sweet chile chicken breast and green onions. Total = 360 calories, 78 minutes of walking. Grilled chicken, cherry tomatoes, carrots, spinach and romaine lettuce (150 calories), with crispy onions (80 calories), balsamic vinaigrette (130 calories).Total = 360 calories, 78 minutes of walking. Beef burger, cheddar cheese, lettuce, tomato, pickles, onion, served with traditional condiments. Total = 510 calories, 110 minutes of walking. Cooperation in Providing Nutritional Information: This year the media communications department was helpful and tried to provide as much information as possible. Thank you! Best Bets: The CafePlus is not bad because, at the very least, you get the protein from the tuna, and it’s low in calories. Maybe you can get rid of the cookies (give them to the flight attendant as a gift). I also like the Cobb Salad, and the good news is that the dressing is typically on the side. In terms of snacks, the only one that looks good is the chips and salsa at 130 calories. The nuts would be great; however, you need to split them with eight to 10 people. Avoid the new Bacon/Egg Salad Croissant Box at more than 700 calories. Blue Diamond Roasted, Salted Almonds $5.00 (1,020 calories, 220 minutes of walking). Pringles $3.00 (390 calories, 84 minutes of walking). Mini Chips Ahoy! $3.00 (550 calories, 119 minutes of walking). M&M’s (525 calories, 113 minutes of walking). Mareblu Naturals – Blueberry Pomegranate $4.00 (450 calories, 97 minutes of walking). Late July Organic Sea Salt Multigrain Chips & Frontera Chunky Tomato Salsa (130 calories, 28 minutes of walking). Chicken salad (140 calories), Partners crackers (80 calories), PopChips (50 calories), Walkers white chocolate and raspberry cookies (120 calories), Ocean Spray Craisins (100-calorie pack) and Emerald natural almonds (100-calorie pack). Total = 590 calories, 127 minutes of walking. Madi K’s Almonds roasted salted blend trail mix (140 calories), Pepperidge Farm Distinctive crackers (70 calories), Glacier Ridge Farms white cheddar cheese (50 calories), Walkers shortbread round cookie (80 calories), Brach’s Star Brites mint (20 calories). Total = 360 calories, 78 minutes of walking. Sun-dried tomato tortilla filled with eggs and smoked turkey, garnished with tomatoes, fresh baby spinach and cream cheese, accompanied by fresh seasonal fruit and fruit yogurt. Total = 701 calories, 151 minutes of walking. Multigrain ciabatta bread with sliced smoked turkey, salami and provolone cheese served with a basil pesto spread, Sun Chips and Milano cookies. Total = 969 calories, 209 minutes of walking. Mediterranean salad mix of fresh romaine lettuce, olives, cucumber, red onions and diced tomatoes topped with grilled sliced chicken breast served with Greek vinaigrette dressing. Total = 441 calories, 95 minutes of walking. Cobb salad with diced breast of chicken, eggs, corn, chopped bacon on a bed of mesclun lettuce mix, served with ranch dressing. Total = 390 calories, 84 minutes walking. Fresh seasonal fruit paired with a trio of Brie, cheddar and smoked Gouda accompanied by Pepperidge Farm crackers. Total = 370 calories, 80 minutes of walking. Oven-roasted chicken, turkey bacon, tomato and lettuce wrapped in Lavosh Bread with avocado mayo spread. Served with kettle chips and Milano cookies. Total = 630 calories, 136 minutes walking. Flaky croissant filled with turkey bacon, cheese and egg salad complemented by fresh fruit and yogurt. Total = 730 calories, 158 minutes walking. Health Score: (**3/4) Last year JetBlue started to offer more than just snacks, but only on longer flights. The problem is that they still need to add some healthier real meals and snack options. The individually packaged snacks are portion-controlled; however, most are lacking in any real nutritional value. And the worst part is that they no longer sell nuts — which were the most nutrient-dense offering they had. Best Bets: Not much in the snack area to eat other than the Quaker Multigrain Fiber Crisps. They are made with whole-grain oats — nice touch. Try to stick with no more than one snack. Just because they are free and they let you take more than one doesn’t mean you have to take them, especially if you’re not hungry. In terms of the meal boxes, the Shape Up is the clear winner if you’re thinking of this as a meal. It has 8 grams of fiber and only 2 grams of unhealthy saturated fat. While the Cheer Up is low in calories, I’m not sure it will do the trick as a meal. However, if you’re just looking for a snack and you share it with someone, you’re only at 130 calories. – Linden’s Chocolate Chippers (135 calories, 29 minutes of walking). – Quaker Multigrain Fiber Crisps- Blackberry Pomegranate (90 calories, 19 minutes of walking). – PopCorners Popcorn Chips (140 calories, 30 minutes of walking). – Stauffer’s Original Animal Crackers – 1-ounce bag (100 calories, 22 minutes of walking). – Terra Blues Potato Chips – 1-ounce bag (130 calories, 28 minutes of walking). Old Wisconsin Salami (90 calories), La Panzanella Rosemary Crackers (80 calories), Oakfield Farms Cheddar Cheese Spread (70 calories), Stacey’s Bagel Chips, (130 calories) Belle Crème Gourmet Cheese Spread (70 calories), Brothers All Natural Fuji Apple Fruit Crisps (28 calories). Total = 468 calories, 101 minutes of walking. Wild Garden Sun-Dried Tomato Hummus (63 calories), New York Style Pita Chips (130 calories), Sheffa Zesty Snack Mix (118 calories), Emerald Natural Almonds (100 calories), Sun-Maid Raisins (45 calories), Brothers All Natural Asian Pear Fruit Crisps (28 calories). Total = 484 calories, 105 minutes of walking. Total = 570 calories, 123 minutes of walking. Trio of premium cheeses: Swiss, smoked cheddar and hot pepper, dried apples and cranberries, crackers. Total = 260 calories, 56 minutes of walking. Health Score: (**1/2) Their snacks are still high in calories with few healthy offerings. Best Bets: Your best bet is the Sabra Roasted Red Pepper Hummus with Pretzels; at least the hummus has a few health benefits. The Fruit and Nut Blend is a decent nutrition choice, but make sure to split it with at least two other people. Nuts are very high in calories but will help fill you up. If you’re on a longer flight, the best choice is a new item — Marcus Samuelsson’s New American Table Turkey and Chutney Sandwich, which is packed with protein and even has apple slices on the sandwich for flavor. It’s only 323 calories without the chips (give them away or refuse them). Another good choice is the Boston Market Chicken Caesar Salad with chips (which you can give away) and dressing for 660 calories. I like the fact that the dressing is on the side (use it sparingly). Again, you need to make sure you differentiate a snack from a meal. A 600-calorie snack is very high; however, a 600-calorie meal, especially for dinner, can be reasonable. Watch out for the Boston Market Deli Chicken Pesto and the Boston Market Turkey Carver — they have way too many calories for one person. For breakfast, the fruit and cheese plate is an OK choice. I like it because at least it has walnuts and grapes, and the cheese portions are small. The Breakfast Café Croissant Sandwich is low in calories at 320, and the ham might fill you up nicely. The other breakfast choices are high in calories, low in nutrients or both. Buttermilk biscuit (350 calories), cheddar cheese (165 calories), smoked turkey breast (35 calories), tomato slice (4 calories). Total = 554 calories, 120 minutes walking. Walnut halves (13 calories), Freshers cream cracker (156 calories), Swiss cheese (0.75 ounces, 81 calories), cheddar cheese (1 ounce, 114 calories), Muenster cheese (0.5 ounces, 52 calories), red and green grapes (36 calories), dried cranberries (5 calories). Total = 457 calories, 99 minutes of walking. Roasted turkey and cheddar cheese on breakfast bread. Served with Hellmann’s Dijonnaise and Stacy’s Cinnamon Pita Chips on the side. Total = 320 calories, 69 minutes of walking. Pepperidge Farm Distinctive Crackers (80 calories), Pepperidge Farm Toasted Sesame Crackers (70 calories), Glacier Ridge Farms White Cheddar (0.75 ounces, 50 calories), Sun-Maid Raisins (90 calories). Total = 290 calories, 63 minutes of walking. Fruit and Nut Blend $4.49 (487.5 calories, 105 minutes of walking). Megabite Chocolate Chip Cookie $3.29 (450 calories, 97 minutes of walking). Lay’s Stax Potato Crisps $3.29 (6 ounces, 900 calories, 194 minutes of walking). Gourmet Chocolate Waffle (Price not available) (342 calories, 74 minutes of walking). Morning Glory Breakfast Cookie (Price not available) (310 calories, 67 minutes of walking). Sabra Roasted Red Pepper Hummus with Pretzels (Price not available) (250 calories, 54 minutes of walking). Smoked turkey breast (70 calories), romaine lettuce leaf (2 calories), Granny Smith apple slices (51 calories), apple cranberry chutney (30 calories), cracked wheat bread (170 calories). Served with Miss Vickie’s Simply Sea Salt Chips (210). Total = 533 calories, 115 minutes of walking. All-natural white-meat chicken, cheddar cheese, lettuce, tomato and Dijon-mayonnaise served on an artisan roll with Miss Vickie’s chips. Total = 980 calories, 212 minutes of walking. All white-meat chicken topped with pesto aioli, mesclun greens and tomato on sliced multigrain bread. Served with sweet garlic dressing on the side and Miss Vickie’s chips. Total = 1,240 calories, 268 minutes of walking. Sliced oven-roasted turkey breast, Swiss cheese, creamy Parmesan spread, tomato and leaf lettuce on artisan-style bread with Miss Vickie’s chips. Total = 1,000 calories, 216 minutes of walking. Available on afternoon transcontinental and Hawaii flights that depart before 8 p.m. Crisp romaine lettuce, all white-meat chicken and Parmesan, Romano and Asiago cheeses. Served with creamy Caesar dressing and SunChips on the side. Total = 660 calories, 143 minutes of walking. Cooperation in Providing Nutritional Information: Not helpful at all. I had to contact them repeatedly. They are back to their old ways. Health Score: (** 1/4) Delta’s individual snack choices are not very good, but their meal choices on longer flights are reasonably healthy. Still, they can do much better. Best Bets: In terms of individual snacks, there are no good options; however, sharing a Flight Delights snack box is a pretty good idea (or have it as a meal and eat the whole thing). It has a variety of nutrient-dense foods that are low in calories for what you get. Of the breakfast options (on flights of 3 ½ hours or longer) your best bet is the Breakfast Snack, which has light yogurt and a fresh banana. Delta also offers a fruit and cheese plate that’s available for breakfast, lunch and dinner. The cheese is very high in calories, but it’s still a nice option if you skip the crackers; at least you’re getting some nutritional benefit from what you’re eating. For lunch/dinner options, there are not too many offerings. You have the Chicken and Turkey Cuban at 552.5 calories or the Turkey Peppercorn Ranch Ciabatta at 576 calories. The chicken and turkey is the lower-calorie choice and is probably healthier based on the ingredients — try to have only half the bread. Good Sense Trail Mix (650 calories, 140 minutes of walking). Sour Cream and Onion Pringles $3.00 (375 calories, 81 minutes of walking). Milk Chocolate M&M’s $2.00 (440 calories, 95 minutes of walking). Bumble Bee Chicken Salad with Cranberries (140 calories), Freshers Crackers (54 calories), Whole Grain Cheddar Cheese Crackers (180 calories) Milano Cookies (120 calories), Planters Trail Mix (290 calories), Twix (80 calories). Total = 864 calories, 187 minutes of walking. Doctor Kracker Snackers (130 calories), Mediterranean vegetable spread (50 calories), olives (60 calories), summer berry blend dried fruit (70 calories), Tuscan almonds (100 calories), Almond Roca (67 calories). Total = 477 calories, 103 minutes of walking. Aged cheddar, havarti and smoked fontina, green grapes, pecan halves, dried apricots and crackers. Total = 475 calories, 123 minutes of walking (estimated by Diet Detective Staff Nutrition Expert). Premium vanilla yogurt layered with blackberries and peaches. Total = 182 calories, 39 minutes of walking (estimated by Diet Detective Staff Nutrition Expert). Cinnamon Raisin Bread (two slices), Boar’s Head Maple Turkey Breast (2 ounces), turkey bacon (two strips), sliced Swiss cheese (1 ounce), honey mustard (one pack). Total = 416 calories, 90 minutes of walking (estimated by Diet Detective Staff Nutrition Expert). Cuban Roll (6.5”), Boar’s Head Cajun Turkey (1.5 ounces), Boar’s Head EverRoast Chicken (1.5 ounces), lettuce leaf liner, kosher dill pickles, Swiss cheese (1 ounce), deli-style mustard (0.5 ounces). Total = 552.5 calories, 119 minutes of walking (estimated by Diet Detective Staff Nutrition Expert). Seeded multi-grain ciabatta roll (4.5”), Boar’s Head Pepper Turkey (3 ounces), turkey bacon (two strips), smoked Gouda (0.75 ounces), Parmesan ranch spread (1 ounce). Total = 576 calories, 124 minutes of walking (estimated by Diet Detective Staff Nutrition Expert). Cooperation in Providing Nutritional Information: Very helpful; really very nice people. Health Score: (*3/4) Not much variety and not much in terms of nutritional value. Honey or dry-roasted peanuts (70 calories, 18 minutes of walking). Ritz crackers (200 calories, 43 minutes of walking). Wheat Thins (100 calories, 22 minutes of walking). Sweet & Salty mix, kettle flavor (100 calories, 22 minutes of walking). · Nabisco Airplane Cookie (120 calories, 26 minutes of walking). Cooperation in Providing Nutritional Information: None. They did not return any phone calls or e-mails. We tried to reach their media department at least 10 times by e-mail, phone and even cellphone. Their only response was that they didn’t have time to provide the information in time for our deadline. Huh? The info is on the package. I guess Spirit figures if they price their seats low enough they will get passengers. Well, have you heard of People’s Express? No? They had the same philosophy. You need to care about your passengers. Shame on you, Spirit Airlines. Best Bet: Bring your own food!!! However, I guess the soup, at only 300 calories, could work as a meal. Keep in mind that all the calorie information below was estimated by our staff from the Spirit Airline menu descriptions and food manufacturers’ websites. Snacks Jumbo-Size Combos $4.00 – 7-ounce Family Size (910 calories, 197 minutes of walking). Jumbo-Size Spirit Nuggets & Nuts: A blend of pretzels, cashews and almonds $4.00 (580 calories, 125 minutes of walking). King-Size Peanut M&M’s $3.00 (480 calories, 104 minutes of walking). Cup Noodles Chicken Flavored $3.00 (300 calories, 65 minutes of walking). Pringles $2.00 (220 calories, 48 minutes of walking). Animal Crackers $2.00 (240 calories, 52 minutes of walking). Muffin $2.00 (360 calories, 78 minutes of walking).